On January 31st, 2019, it is with saddened hearts that we announce the passing of our loving mother, grandmother, great-grandmother, and friend Margaret Katryk. Born in Sydney, Nova Scotia and raised in Whitney Pier, Margie was the daughter of the late Charlotte (Bachanski) Porga and Joseph Porga. She devoted her life to her family and was well loved within her community. Everyone that met Margie was well acquainted with her warm, contagious smile, her gigantic hugs, her kind nature, and her generous heart. She spent her time playing cards, enjoyed playing bingo, and watching rerun after rerun of Family Feud. But, above all else, Margie loved the company of her family and friends. Her doors were always open, the tea was always on, and, because of her love of cooking, company always left with a full stomach. Her children and grandchildren were Margie’s pride and joy. She was so happy because of their accomplishments and a day wouldn’t pass where she wasn’t sharing stories about them. Her husband, Stanley, was the centre of her life—together they shared two children and a lifetime of happiness. She is survived by her daughter, Joanne (Bob); son, Stan (Theresa); grandchildren, Tony (Jaime), Marc (Philippa), and Kenzie; great-grandchildren, Jaelyn and Riley; sisters, Ann (late Julius) and Ella (Mike); sister-in-law, Bernadette; great-aunts, Olga Simko and Eva Kandravy (both of Montreal), and her many nieces and nephews of whom she adored. Besides her parents Margie was predeceased by her husband, Stanley; brothers, Frankie (late Feemie), Rudy, and Billy at infancy. 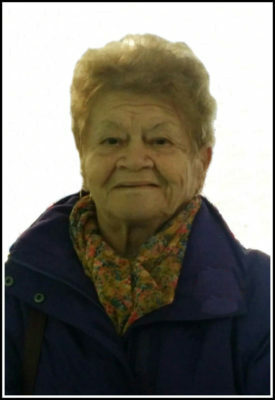 Visitation and memorial service to celebrate the life of Margie Katryk will be held at Pier Community Funeral Home, 1092 Victoria Road (entrance on Church Street) on Tuesday, February 5, 2019. A gathering of family and friends will take place from 10 – 11 a.m. with the memorial service to follow at 11 a.m. in the All Faith Chapel with Fr. Paul Murphy officiating. Light refreshments will be served in the reception area following the service. The family would like to extend a special thank you to everyone at City Homemakers, VON, and the doctors and nurses of Palliative Care of the Cape Breton Regional Hospital. Anyone who visited, sent cards, or showed their support in any way, we thank you from the bottom of our hearts. In lieu of flowers, donations may be made to Hospice Palliative Care Society of Sydney or the Cape Breton Cancer Centre. My Condolences on your mom’s passing. She was a Beautiful woman, I grew up living next door to her, she was friendly and always said hi….God Bless. Joanne and Stan: So sorry for the loss of your mom!